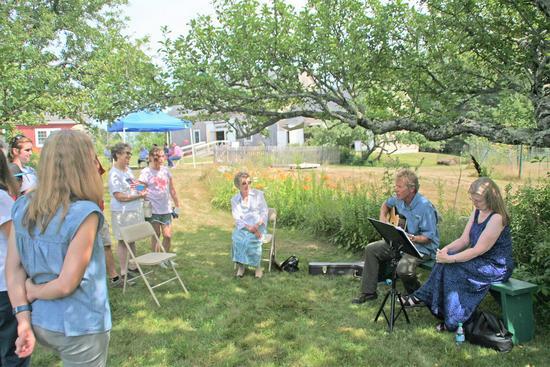 The Deer Isle-Stonington Historical Society joined with organizations across the Blue Hill Peninsula on Sunday, July 29 for the annual “Touring through Time” event, aimed at educating the public about the rich and varied history of the area. 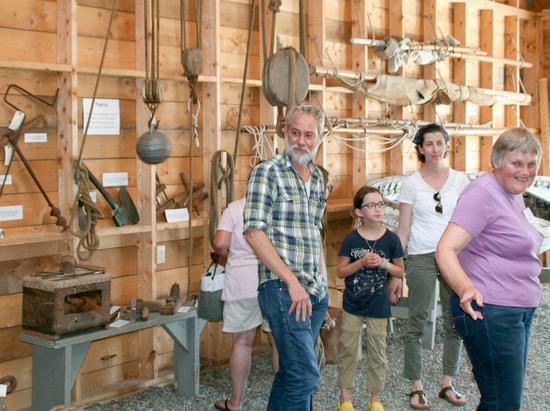 Presentations, tours, interactive exhibits, music, a scavenger hunt and demonstrations showcased the wealth of educational resources available to visitors interested in learning about Deer Isle’s history. Exhibit topics included Native American and European settlement; the farming, fishing and granite industries; lighthouses; the Civil War; maritime history; and island business life. There was also an actual lobster boat and the Fishing Hall of Fame. A victory garden, archive library, exhibition barn, gift shop, and the historic home of Salome Sellers, make the Society one of the most informative and interesting in the area. 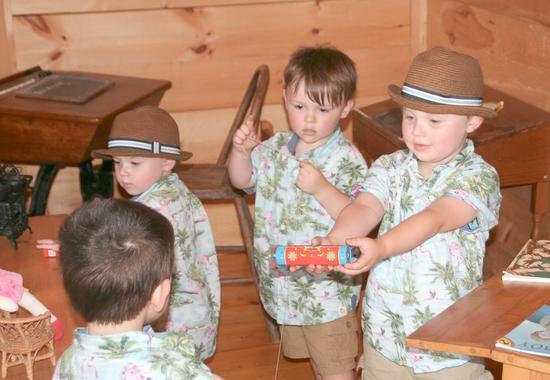 Sterling and Spencer Lymburner and Daniel and Nathaniel Fugere are the fifth great grandsons of Salome and Joseph Sellers, whose home is a central part of the Historical Society’s exhibits. 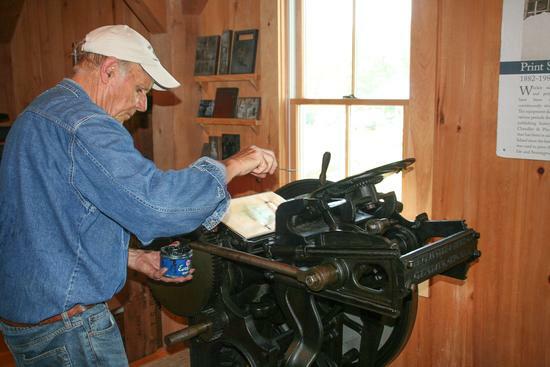 Penobscot Bay Press Publisher Nat Barrows fires up the letter press he used until the 1980’s for small print jobs. The press is 130 years old and used to be powered by foot pedals. 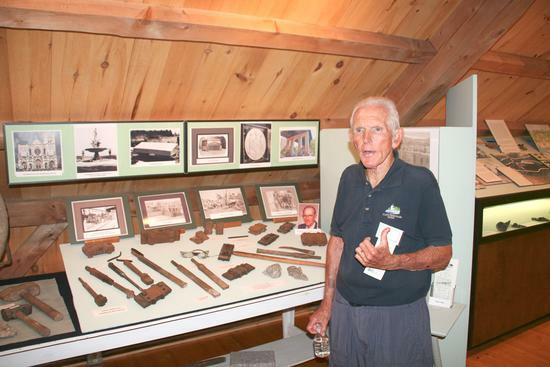 Volunteer Tom Halpin gives a tour of the second floor of the exhibit barn where information on the granite industry, Native American culture, and life on the island in the 1800’s can be found. 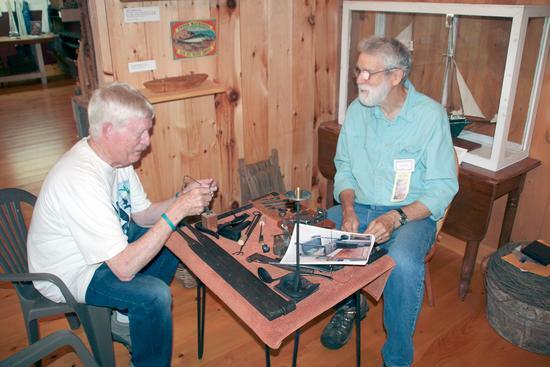 Blacksmith Ian Walker shows Peter Marsh of Sunset tools and hardware used by earlier residents of Deer Isle. Frank Gotwals and Cindy Coombs sing a sea shanty about the famous New England Captain Howard Blackburn. Blackburn lost his fingers rowing his dory to Newfoundland in winter, after being separated from his schooner. The Davis family from New York learns about the island’s lobster industry. Attending the annual event has become one of their favorite family activities.